Peter Bugel 12/12/ 1944 – 1/14/2019 is the son of Lucille Peek and Harry Joseph Bugel, brother of Susan B. Incendio and uncle to Sara B. Lozano. Born in Indiana, Peter moved to Nashville, TN when his father took a job at the new VA Hospital. From family photographs and stories, Peter focused on music and school. Peter’s mom, Lucille died of Pancreatic Cancer in 1958. Joe, his father, remarried in March of 1960 to my mother Alice Martin Huffman. Peter was 17 when I, Anne Harriette came along in the fall of 1961. Family lore says I was born on the night of his West End High School Senior production, class of 1962. My next memory of my big brother is of mom, dad driving us to Wake Forest, NC to see Peter in a production of Amal and the Night Visitors in which he played one of the 3 Wise Men. I am not sure which came next … enlisting to avoid being drafted in to Vietnam, I believe. At the time, I did not learn what really happened there. What I do remember is that soon after he came home, he took me on my first date to the Blue Hawaii Restaurant. We dressed up and he taught me how to use chopsticks. Attending the Boston Conservatory of Music came next where he studied piano and voice. Las Vegas was the next stop where he lived 30 plus years. He made a living as a professional singer and dancer at the Star Dust Hotel as well as a professional vocal coach for many famous celebrity performers and he taught in the faculty of the Music Department of the University of Nevada. Peter divided his time between Las Vegas and Nashville, TN to actively participate in the care of our father until his death in early 2000s. Peter eventually relocated to Nashville to care for my mother until her death in 2014. His generosity of spirit, belief in family, his genuine kindness, and protecting my mother’s estate when she wouldn’t let others. I am forever grateful to my big brother for taking the lead in our mom’s care. Peter kindness and generosity extended into the community as he invested time, talent, and creative genius to Nashville. He participated in an “Ole Men’s” club at the YMCA. Veteran’s Support Group at the VA. His energy was truly devoted to the thriving Ballroom Dance community. He was an active member participating weekly in classes, open dances and all-around support. Peter was the Registrar for the local amateur dance group (USA Dance) and served in that capacity even when he was feeling well. 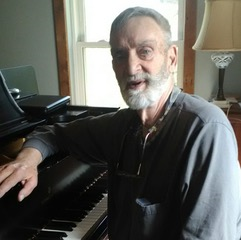 He continued to offer private and group voice lessons, professional vocal coaching, and playing piano at Lynn’s Christmas Party. Peter was a private individual. Many did not know of his military service or the impact over his life time. Peter’s medical issues, stemming from his service in Vietnam, warranted the awarding of 100% Disability. In May of 2017 Peter’s overall health picture met criteria for hospice service. His decline was slow, yet graceful, with courage and dignity … always a positive outlook. The image I hold in my mind’s eye is that of a jelly fish moving beneath the surface, pulsing like a dancer, focused on the rhythm of the tide like a musician, gliding homeward bound. He died Monday evening, January 14, 2019. His heart just stopped. He is survived by many friends, devoted care companion Judy Boyles, an extensive extended family and immediate family members: his sisters Susan Incendio and Anne Harriette Bugel and his niece Sara Lozano. The family ask that in lieu of flowers, please support your local musicians and dance scene in Peter’s memory. What about taking music lessons, learn an instrument, attend the opera or a theater production or perhaps learn to Tango, Salsa, Fox Trot, Waltz, Swing, Zydeco … See ya on the dance floor. The USA Dance this Sunday will be a Memorial Dance for Peter. The event is from 2 – 5 pm. See USA Dance http://www.usadancenashville.com for details. What a lovely eulogy for a life lived fully. Much love to you, Harriette. We will certainly miss Peter at Immanuel. What an interesting life Peter lived! Even though I grew up with Peter and Susan, there was a lot I did not know about Peter’s life. Thank you Anne for such a wonderful history. We will miss Peter, but at the same time we are thankful for his life and having known him. You will certainly be in my thoughts and prayers. A full life indeed! Much like his sisters! Thank you for such a beautiful and loving obit. I am a classmate (class of ’62) from West End High and appreciate your allowing me to look inside the life of such a sweet, kind, talented man. May you rest in peace, my friend, and on Wed., Feb.13, I will take my pie to go and think of you fondly. I am also a classmate of Peter and participant in a monthly West High School class of ’62 luncheon group that Peter regularly attended. I know he enjoyed the luncheons because many times he was present when he should have been home resting. He will be missed by everyone but I know he will not be forgotten. Your words paint a picture of your brother in a tender, loving way, Harriette. May Peter’s memory be a blessing. God grant him everlasting peace. I will always be fascinated by the fact that if Peter was not involved in a conversation with someone he was humming a melody to himself. We sang together several years in choir class at West High. He was such a talented man who carried himself with dignity to the end. It will be a surreal experience to not having him at the end of the table at Ocharleys the next time our crew meets. Peter will be missed, but never forgotten. Blessings to all who loved him. I’m thankful that he and his love of music were a part of my high school days. I too was a classmate of Peter. We met in the seventh grade–I loved attending sock hops at his home. He played at my wedding. We reunited while planning our 50th high school reunion, and I enjoyed our monthly luncheons. His talents–voice, piano and dance–were incredible. I will miss him but am comforted that he is at peace. My sympathies to all who loved him. Another classmate (Class of 1962) of Peter. Since joining the monthly “lunch bunch” I have develop friendships with classmates I didn’t know that well or hadn’t seen in years. Peter is a friendship I will miss….a void !!! As one can see from the many messages from his classmates…he will be missed. Such a part of our gatherings. Peter, all of us got so much from you…our gain. Thanks !!!! Your seat at the head of the table is yours forever !! What a lovely tribute to Peter! I, too, was a classmate from the class of ’62, and know how important our monthly reunion lunches were to him. He was a fine friend and a gifted musician. Don’t you know that he and Mary Lou are cavorting happily in heaven together–at least when Peter isn’t leading the choir! You will be sorely missed, my friend! I will miss my dear friend I got to know at HTCC. I looked forward each week to our lively conversations and our few moments alone just being in one another’s presence. He always quietly sang me a tune. I shall truly miss his profound inspiration insight in Adult Education each Sunday morning. So sorry to hear of Peter’s passing. This was a beautiful eulogy, and although I listened to him sing kareoke for years and only got to know him later in his life, I had no idea about most of his bio. A humble guy, indeed. I’ll miss his crooner songs and American standards.